A public nuisance is generally considered one who causes inconvenience, annoyance, or inflicts damage upon other individuals or an entire community. At the very least, this label aptly describes the Sacramento Municipal Utility District (SMUD) as it applies to its treatment of customers who have had concerns related to wireless smart meter deployments over the past couple of years. In fact, one SMUD customer recently filed a legal Complaint for damages for Negligence, Public Nuisance, and Unfair Business Practices related to smart meter installations. This customer refused to allow the installation of a smart meter on his residence and refused to join the opt-out program due to SMUD’s discriminatory fees. He declined having a smart meter because of the alleged dangers of pulsed radiofrequency (RF) radiation that smart meters emit and the health risks to his family. SMUD at one point began charging the customer the opt-out fees despite his argument that he never opted out, and he never opted in. Based upon the continued dispute which occurred over a period of months, SMUD eventually terminated the customer’s electrical service during last summer’s heat wave (2013). His power was eventually restored, but without a meter and his bills were estimated. The complete allegations of fact are contained within the linked Complaint. Some of the facts surrounding the legal Complaint were discussed at last month’s February 2014, SMUD Board meeting as shown in the video. SkyVision Solutions would like to present evidence at this time which would tend to support allegations contained in the legal Complaint. In 2012, the Sacramento Municipal Utility District (SMUD) performed a study to determine how many radiofrequency transmissions were occurring per day. Originally, SMUD had claimed (or only acknowledged) that six (6) transmissions were occurring per day. Actually, the average SMUD smart meter transmits several thousands of times per day as displayed below. So, as you can see from the above table, it is true that the utility “detailed analysis” shows that the “meter read data” for each customer is transmitted 6 times per day. 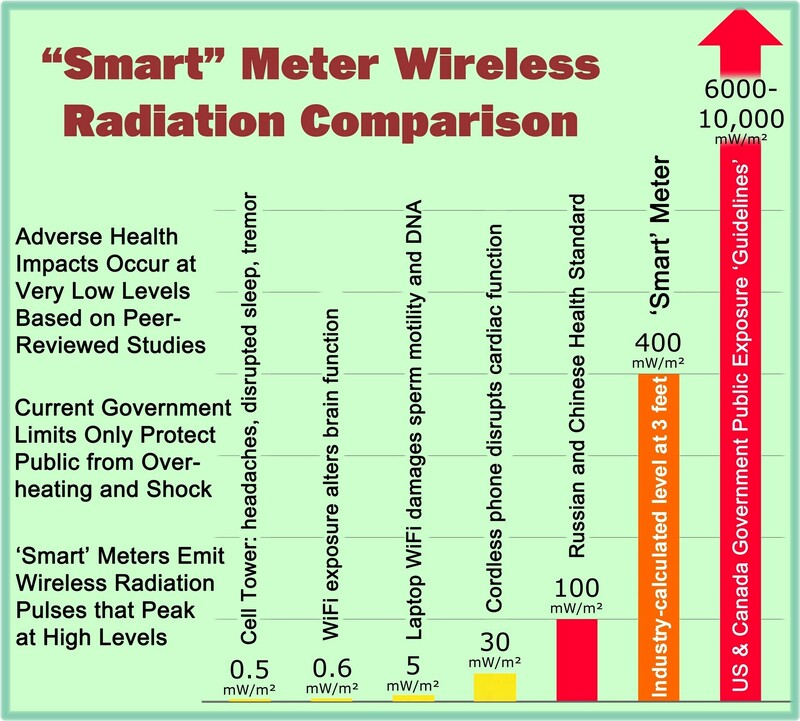 But if you are a person concerned about the RF emissions from a wireless smart meter, you are obviously interested in the total number of “bursts” of RF energy from the meter. There are actually thousands and thousands of RF transmissions occurring for each wireless smart meter each day. Furthermore, there is no practical manner for an individual customer to know if his or her smart meter is “only” transmitting at the average rate of 13,000 times per day, or if you are the unlucky person who has a meter that is transmitting at a rate of more that 200,000 times per day. SMUD has misinformed the public by omission. The utility limited its discussion to the narrow topic of individual customer data transmission frequencies, neglecting to mention the vast majority of RF transmissions that pertain to other functions of the smart meter, such as network management, time synchronization, and activities related to forwarding routed messages for other customers. This entry was posted in Smart Grid, Smart Meters, and RF Emissions and tagged Complaint, Health Effects, Lawsuit, Opt-Out, RF Emissions, Smart Meters. Bookmark the permalink. Pingback: London’s Black Cabs Join Global Revolt Against “Smart” | Stop Smart Meters! Thank you for bringing this public travesty into the light of day. Let us never forget how these elected public officials speak about us and they actually work directly for us!